Hi all this is my first post, I’m rebuilding an NG TC V8 kit car, MGB based, 3.5 Rover V8 and I am fitting a Jag IRS. I have been reading all the threads regarding the MGB front suspension on this brilliant site that I could find so please excuse me if what I’m asking has already been covered. My provisional calculations put my rear roll centre 5 to 7” above ground depending on where I fit it, a big improvement over the B’s solid axle. Now I’m getting to my question, lifting the front roll centre from ground level. I know it can be done and there are kits over there in Donaldland that alter the upright end but being a bloody minded Limey I don’t want to do that. The inboard bottom wishbone pivot point unless there is radical surgery is fixed, so what can be done at the top? As you can’t go up at the bottom let’s go down at the top, taking 125th off the bottom of the Armstrong and the same off the subframe mount according to my simple calc’s raise the roll centre to 0.850”. What do you think guys................Be gentle, I’m too old to fight...........LOL. I haven't checked your math, but your idea makes sense to me. Very clever. I wish I'd thought of this before doing Henk-Jan Vonk's Armstrong-to-coilover mod... it would have been so easy to skim the shocks' mounting surfaces at the same time! 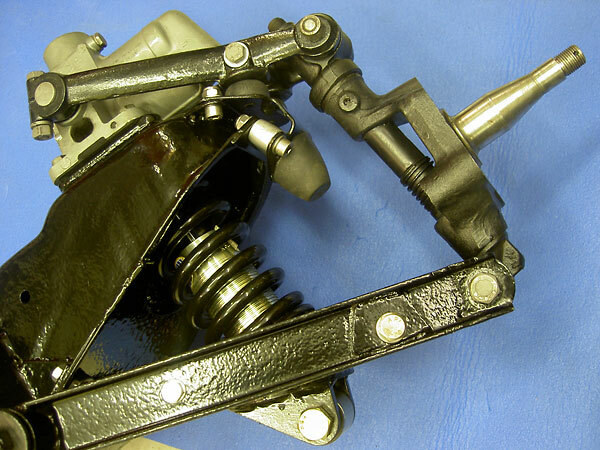 What I did when I still had the MGB suspension in front was to fabricate an upper control arm with heim inner pivots. I made a plate which bolted on where the lever shock mounted but with the pivot mounts about 3/4" lower than the lever shock. I used the stock spring with a tube shock mounted similarly to the coilover pictured above. Never calculated the r.c. but it gave a nice camber change when cornering. Sorry, no pics available. Very cool, Jim! It's sort of like what Dave Headley is doing now with his kingpin mod except he's doing it on the kingpin side of the upper control arm. Oh, and you did it 40 yrs ago? Amazing. This isn't meant to diminish what you're doing now at all but I wish there was a how it was done for your original conversion. Sounds like it was very innovative too. Actually, there is this from the Peterson Engine Swapping book. It doesn't show that mod but it has some of the early stuff on the conversion. I read that article waaay back when! Very nice! What year would that have been? Whatever happened to the car - is it still in operation? Talk about "morphing" - Jim ? That article shows the 1st iteration of the car. The 2nd iteration was the installation of a turbocharged Olds Jetfire engine. To get the engine in under the hood required crossmember surgery and lowering the rack by quite a bit. To eliminate the bump steer that lowering the rack would create I had to narrow the rack and extend the length of the tie rods. This was the point that I made the upper A arm I described above. This is one of the only pictures I have of the Olds engine. If you want to read the entire saga you can read the 5 parts in the project journal section of this forum. A stock 65-66 Mustang with its parallel control arms has a ground level static roll center. The MGB front static roll center is also at ground level with parallel arms. On an early Ford Mustang dropping the upper control arm's inner pivot by 1" raises the static roll center by about 3.5" above ground level. That simple change is commonly known as the "Shelby Drop" and makes a world of difference in the way the car responds to steering input. It also reduces roll due to the reduced roll couple. It's hard to lower the inner pivot on the shock, but you could machine a new trunnion to raise the outer pivot. The Midget guys do this to add camber, but moving that hole up would alter the roll center geometry as well. I don't know that I would thin out the shock or move the mounting plate downward. I would just make the upper trunnion a little taller and leave the shock mount alone. BTW, on most MGB's I've looked at I think it may be possible to add additional shims under the stock upper trunnion to move it up a bit, perhaps another .200" (5-6mm). There's a good bit of thread left on top and a pair of thin jam nuts may make that possible. To answer the original question without reading any of the replies, because one thing popped out at me, the main thing is that you want the vertical separation of the inboard ends of the control arms closer together than the balljoint ends, or you won't gain desirable negative camber when the body rolls in corners. This is far more important than roll center height.